Nike gives comfort and flexibility using durable materials and this Nike Flex Experience running shoe surely complies with all of the valued standards people need to have in their running shoe. This is one of the most appropriate options for those who have a regular power walk routine or they have to attend their workout classes. The shoe is quite capable of supporting the arches and give an ache-free experience no matter how long you wear it during the walk. It supports and comforts the foot at the same time. To have an in-depth look into its comfort features following are some of the most prominent features discussed in detail. The upper part of the shoe is definitely an important thing to look. As a fact it plays multiple roles and is an important component of the shoe in many ways. At first, it provides the style and looks in the shoe so that it can be used without compromising the style aspect. This is suitable for both men and women. The second important role is to keep the foot comfortable and breathable. It is made up of durable and flexible mesh fabric that ensures you will feel light and easy when wearing the shoe. It is also worn and tear-free and keeps the shoe in its actual form for years. The insole of the shoe makes use of sufficient padding along sides, full-length hexagonal flex grooving design and EVA sock liner allow the foot to stay easy and relaxed in the shoe. The sock liner and the well-designed insole offers support and comfort and keep the foot in its natural form so that lesser fatigue and lesser pressure is caused. The outsole is also given a well-structured waffle texture to keep the grip on the ground firm and keeps the user away from possible slipping on any kind of surface. The outsole is made up of high-quality rubber that provides a durable layer for the shoe to keep in its form and maintain its structure without getting torn away. The shaft in the shoe measures around 1.75 inches from the arch so it may give the balanced support for the foot to stay easy and stable while on the go. In addition to this, the Phylon rubber mid-sole in the shoe offers pressure mapping and provide support without increasing the weight of the shoe hence provides extra comfort. As a fact the shoe has been designed to provide support and all-day comfort for the heavy running and activities, it provides a durable shoe construction to avoid wear and tear problems no matter how much you have been using the shoe. You can surely rely on it for better performance. The materials used in the shoe are imported and ensure high-quality finishing for those who are looking for the best for their use. Due to the mesh upper and breathable sock liner, the shoe comes out to be breathable and comfortable for the wearer. The padded sole and collar and soft, flexible tongue and sides making sure to keep a foot in place and easy so that it may not turn. The shoe needs no extra effort to wear and use on a daily basis. Since it’s a lace-up shoe it fits snug and keeps the foot muscles relaxed and easy during the transition phases as you walk or run. Lightweight and arch support well that keeps the fatigue factor far away from the muscles. Highly comfortable and flexible shoe to keep the foot easy while walking or working out and running. Made of quality materials that last for years without wear and tear issues. Light in weight and easy to use that keeps the foot free from any kind of pressures. Pressure mapping via specialized insole and arch support leave foot relaxed and avoid impact on the foot reducing fatigue and aches. The outsole is designed to lower the external impact and also keeps the foot slip free on any kind of surfaces. The shoe is a bit narrow and people having healthy or bulkier feet may need a larger number or wider shoe instead of a regular shoe. Since it’s a trusted shoe product that has been used by thousands of customers with verified performance and satisfaction, you can surely trust this one as one of the most reliable running shoes. The shoe has earned approximately 4 out of a total of 5-star rating on various online retail shops. 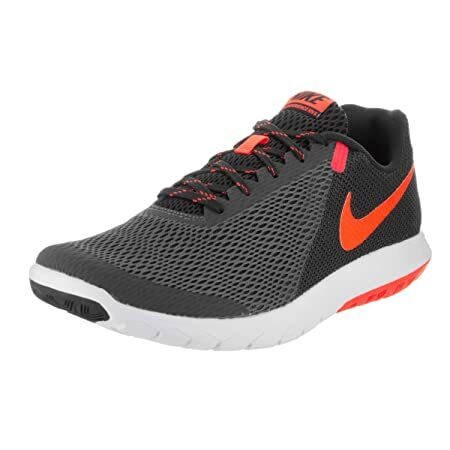 Concluding our discussion for the running shoe we can say that this Nike Flex Experience running shoe is no doubt a flexible shoe for those who need to carry out their work out routine without getting pain in their feet. This ensures your foot stays easy, well-supported and in its natural form by lowering the pressure points and resisting pressure in an easy way. You can use it for hours without getting any itchy feelings and it is breathable enough to keep your foot free from sweating problems as well. The overall materials and construction of the shoe ensure that the user will never feel disappointed. Make sure to choose the correct size as per your foot size and bulk to avoid any sort of inconveniences regarding comfort and usage of the shoe you have to buy.